Rock drilling performance of O1 tool steel was simulated at laboratory scale using mortar specimens. Mortar specimens were prepared with cement-to-sand ratio of 1:2 and cured for 7 and 30 days to simulate soft and hard rocks, respectively. Rock drilling performance of tool steel was measured in terms of corrosion, tribocorrosion, and wear of mortar specimens in the presence of 3.5 wt% NaCl solution. The tribocorrosion properties were measured by modification of a tribometer and adding a three-electrode setup where tool steel pin was used as a working electrode counterpart against mortar sample. 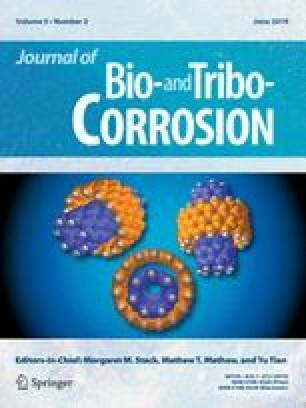 The effect of mortar on corrosion behavior of tool steel was measured by potentiodynamic polarization tests, while the tribocorrosion was monitored by open-circuit potential tests. It has been found that the mortar specimens negatively affect the corrosion and tribocorrosion, and thus improve the corrosion performance of tool steel. This effect was more prominent against 7-day-cured mortar specimen compared to 30-day-cured specimen. Various factors, such as mechanical properties of rock material, cutting fluid, drilling mechanism, and dissolution of minerals, which can affect the tool life are discussed.